I don’t make frit often and I use it even less often. I made big batches in 2013 and I’m still using it up. These are the kitchen sifters in various size mesh screens that I use to sift into three sizes. A bowl of all my shorts and the frit crusher. I bought this frit crusher in 2007, it’s still going strong. This blog contains two recipes and two methods for making frit, along with a quick cheat sheet for my favourite frit making method. Frit is crushed glass that is used by glass artists as decoration. Frit comes in a range of sizes, colours and coefficients. There are arguments for and against making your own COE104 “crushed glass”. Personally, I like making my own frit, but I also buy it sometimes. In general, working within the same coefficient of expansion when making glass beads leaves you less likely to encounter incompatibility fractures down the track. Making your own frit offers more flexibility in your colour palette, because you can make exactly the colour palette you need. I purchase premade frit blends sometimes, with my staple being Reichenbach “Raku” Iris Orange frit. Another glass artist gifted me some Val Cox Frit a few months ago and it has been quite interesting and fun using it. Although I’m always a little nervous when it comes to mixing coeffiecients, I’ve had no problems with Val Cox 96COE frit on top of 104COE glass and my friend’s generosity changed my mind about using COE96 frit. Designing with frit is usually one of the first things learned after making a round bead, because it’s easy and fun to do and yields very pretty results. For instance, all types of frit can be used on the surface of a bead. Frit can be melted in flat or left raised for a textured rough effect. Bead makers can decorate over the top of frit, gravity swirl it, twist frit into stringer and do lots of other interesting combinations to create unique beads. Pretty! A rainbow of frit! This photo is from 2013 when I first made it all up. This photo is trying to show the three different and fairly uniform sizes that I got from sifting using ordinary kitchen sifters. However, when using the same coefficient frit with that of your glass bead you can deeply encase frit as well. COE104 frit can be used to make randomly coloured striped stringer for bead decoration too. All you need to do is heat a gather of Effetre Pastel White or transparent glass and drop that into a heap of frit, melt down smooth and pull a twisty as you normally would. Your frit will provide the beautiful stripes. (This works best with really saturated colours and furnace glass frit COE96). All frit of the same coefficient can be used in a mould to cast glass into shapes or added to the surface of cut class stacks for slumping. There are good reasons for making small batches of your own frit, just like there are good reasons for why it’s too bothersome to do so. Most of the arguments for not making your own COE104 frit revolve around DIY Frit making being time consuming, dangerous or messy or that it is better to use COE 96 frit because the colours are more vivid. However, thifty people will agree that making your own frit is a way to use up all the short or small pieces of broken glass rod lying around, that you do have vivid colours in the COE104 palette and it’s nice to have the exact colours you want on hand. Angry people discover that it’s therapeutic to crush glass. Okay, that last point might not be a really valid reason, but when I’m mad and I don’t want to start a yelling match I bash glass around to alleviate stress. This is home made frit which has been sifted and stored into different sizes. 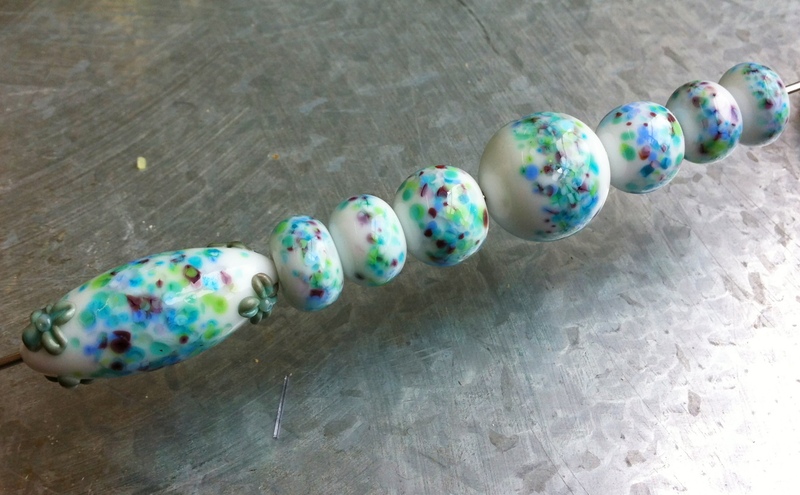 The larger frit has been used on this bead. Using pre-made frit from companies who specialise in it’s production will yield even more uniform results. But why not have the best of both worlds? When you want brilliant vibrant colour on a dark base bead; buy a premade frit, such as the colour blends stocked by Val Cox Frit or Glass Diversions. These frits are made with furnace glass that have a coefficient (rate of expansion) of 96 and recommend a 5% rule; with the old adage “less is more” when applying it to your COE104 beads. As furnace glass is so saturated with colour, less is more is a good rule of thumb anyway. 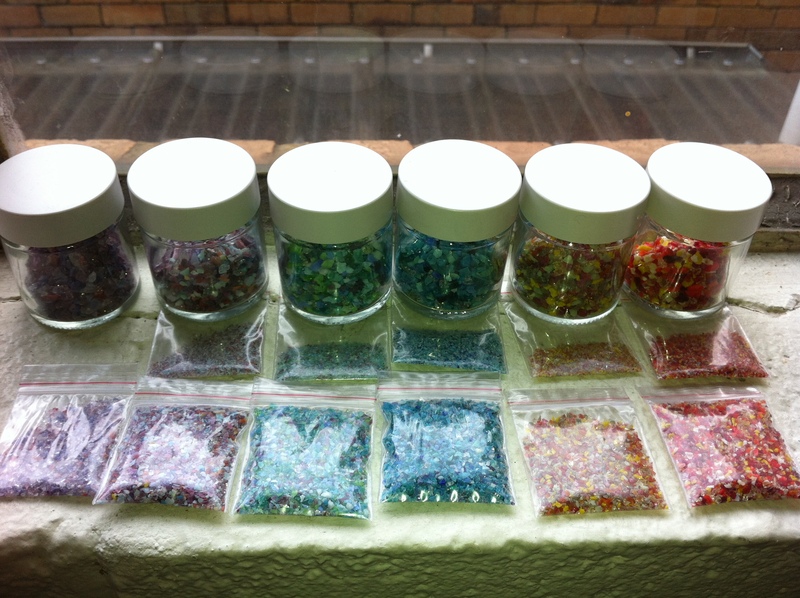 Glass diversions has developed a COE 104 reactive frit line, their test beads show amazing colours. This is where making your own frit comes into its own if you use COE104. You can get brilliant colours if you experiment and pick glass in your 104 range that is saturated with pigment to get the vivid colours necessary for making frit show up on a range of background glass colours. Beads made with Val Cox “Straw Fire” frit. The base is CiM Glacier. You can achieve beautiful effects if you enjoy experimenting. If you don’t like experimenting much and you don’t want to waste time figuring out what glass works best as frit, buy premade blends. It will save you a lot of hassle. We all know Devardi glass rods become frit if you don’t prewarm them (haha), so there is that option. However you can also buy CiM and Effetre frit in individual colours and make up your own frit blends without having to crush glass. Making your own frit blends does require patience and time if you want results like the two quality manufacturers listed above. You need to experiment with glass to see how it looks together, sometimes two colours will react in an unexpected and not particularly nice way. So don’t mix frit together until you have made a trial bead first. Also, don’t expect your “home made” frit to look as professional as a glass frit manufacturer. Your frit will be “chunky”, whereas manufactured frit is “flakey”. Frit manufacturers have specialised glass cutters and grinders that get frit a uniform size and shape. However, you can get a pretty good result if you follow either tutorial below. I used a mish mash of different frit sizes along with enamel to make a bunch of “monster toe” beads. 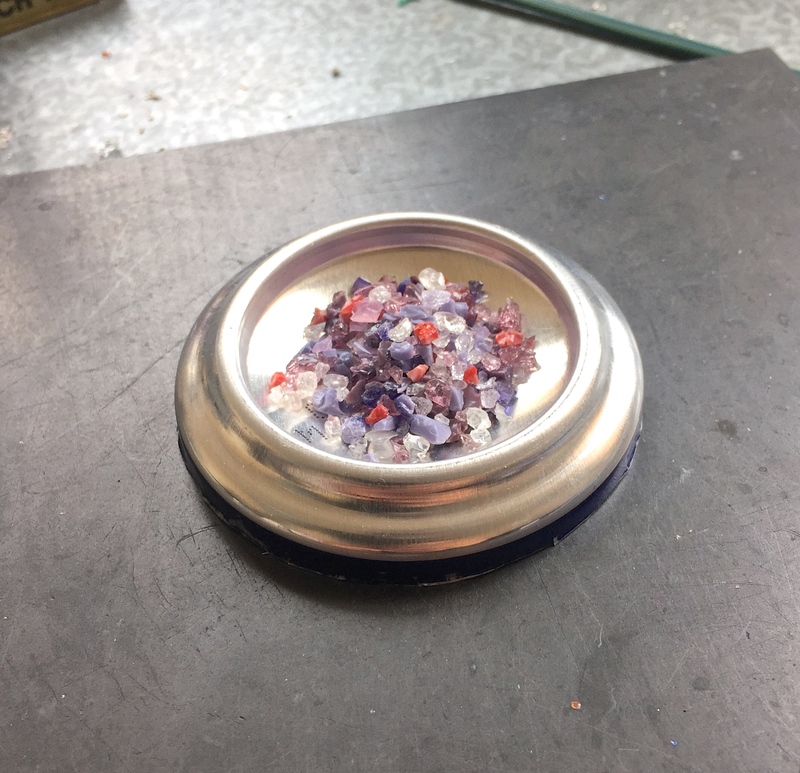 Because I was not fussy about how the frit was to get onto my bead, I laid it out on my marver, but you can buy or make frit trays for more precise coverage. There are two methods of making frit in your personal studio. Firstly, it’s the heat and shatter method (my preference). Secondly, it’s the smash and crush method (which is useful too). The choice is yours depending on how you like to work. Finally, the decision to sieve or not to sieve your frit will greatly affect the final look on your beads and this is the most time consuming component of the entire exercise. All my sieves are inexpensive ones I have found lying around the house or bought from a kitchen department store. None of them are designed for frit sifting, they are “good enough” for the volumes that I make frit in. If you are making a lot of frit you will want to invest in a good set of stackable frit sifters, but, they will set you back at least $60USD. You can find stackable sifters in a number of places, not just glass retailers. Fossicking and gemologist supply stores also sell stackable sifters. If I’m buying frit, generally I buy it in bags rather than in the pretty jars to save on postage. I store frit in the glass jars that herbs come in. In the picture pre-made frit is very even and uniform in size. It’s usually flakes, rather than the chunks that you get from making your own frit. 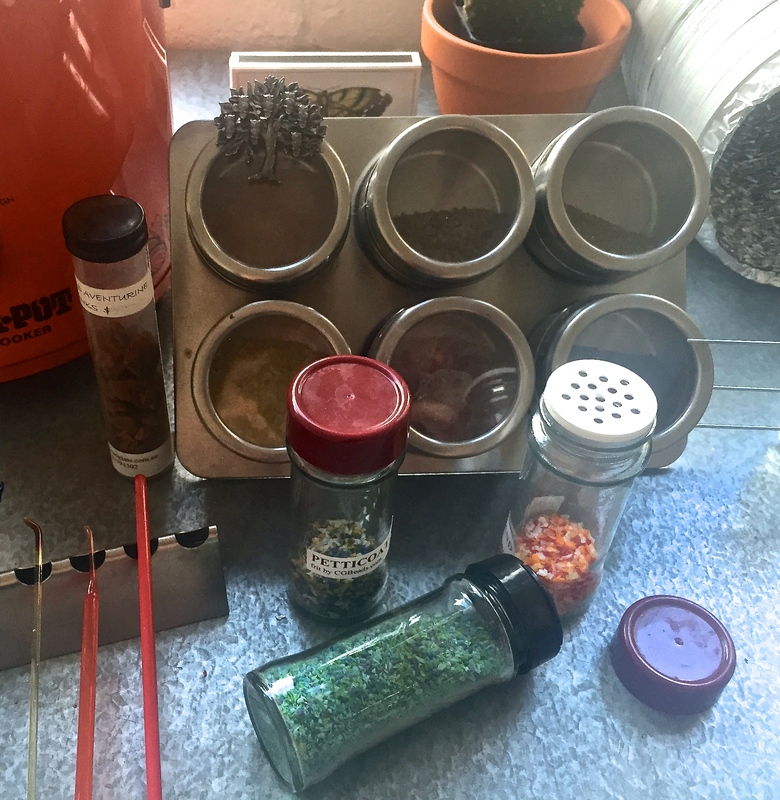 The magnetic spice rack holds my reactive and Double Helix frit. Choosing glass to turn into frit. Some notes on glass that works best, don’t use any of the moonstone colours that devit; such as CiM Cirrus, Peacock Green and Halong Bay and Effetre’s range of opaline rods. These colours are likely to devit or scum in a frit blend (I have learned this the hard way). If you do want to use these colours as frit, use them individually and layer them one at a time or mark a reminder on your packet so that you don’t overheat them. If you want to use Effetre Opaque Pastel Purple “EDP” (evil devitrying purple) be aware that it does devit very easily in frit form and you will need to up your oxygen to remove the devit, this is only successful sometimes and then, sometimes in part. If you have very old batches of CiM Leaky Pen, less is definitely more, it is an overpowering colour that likes to spread. Large pieces of glass will “bully” smaller pieces of glass out of the way and push those small bits of colour to the side of your bead. If you don’t like this look, sieve your frit. Mixed sized frit means that large chunks of glass may cover up smaller pieces if all applied at once. If you want a mix of sizes, use large frit first, then smaller frit for layering effects and colours. Darker opaque colours will hide pale transparent colours and too many opaques can create a muddy surface, particularly if they react with each other (Such as Effetre Corals and glass containing copper. See my photo below of the “yuck” beads). When making a frit blend for the first time, keep your colours separate and layer them as you go to understand how the glass colours work together. Keep notes on how you layered them and how much, so that you have a “recipe” for next time. This is more helpful to do than you may realise. Glass is not like paint and unexpected colour reactions can happen! Method 1: Heat and fracture. With this method you will get anything ranging from chunks 5mm in size to 1mm in size. Get your torch turned on and heat your short until you get a marble sized ball of glass on the end, gently squash it down a little. Then heat the paddle until it’s red hot. Let the paddle cool slightly so it doesn’t drip off the end of the rod and then plunge the flattish ball into a bowl of water. The water will sizzle and the glass will flake off the ball into random chunks. Repeat this process until you have a small amount of frit in the bottom of the bowl in one single colour. Place a coffee filter or a Chux Superwipe over the bowl (rubber band to secure is helpful). Tip the water out completely over a sink so the bowl is upside down. The water should strain through your filter, leaving the frit behind. Bang on the back of the bowl to loosen any stuck glass. Place a dry paper towel onto a flat surface, bang or scrape out any frit stuck to the bottom of the bowl onto your paper. Don’t use your fingers, it’s glass, it will have sharp edges, use tweezers to scrape it out. Leave your frit to dry. This is a frit blend of CiM Glacier and Effetre Dark Turquoise. It has not been sifted. “Home made” frit looks “chunky”. Refill your bowl and repeat for another colour. Keep all of your frit colours separate at this point. (Unless you’re making a blend you’re very familiar with). When the frit is dry, transfer each colour to its own baggie or jar, you can use a funnel to channel the frit in, or just a bit of clean white paper. Optional: If you want your frit to be uniform. The following additional steps are needed. Wearing your dust mask sieve your frit starting with the biggest mesh in your sifters down to your smallest. I use different mini pie tins to sieve into. You can use plastic containers or disposable cupcake liners as well. Then bag your frit up by size. This takes patience and practice. If you are using kitchen sieves and sifters you will have to do a tablespoon at a time. I sift my frit a few times over to be sure that it is very uniform. Frit may get stuck in the mesh of your sieve if it is between sizes, using a stiff dry paint brush knock these bits of frit out onto white paper, then tip them into the bowl containing frit that is closest to that size. Whilst the “Heat & Fracture” frit method yields pretty good results and sifting gives even better results. Sometimes you need to bang up some of the bigger pieces that didn’t fracture properly. Short rods that are far too short for the heat and fracture method can be used in the “Crush It” frit method. With this method you will get anything ranging from chunks to dust, depending on how hard you crush the glass. Pick a range of glass shorts in a single colour. Shorts have to fit in your frit crusher (so nothing too long). To begin, place one or two shorts into the tube end of your frit crusher. Put on your dust mask and safety glasses and get ready to crush! Slam the pommel end down onto the glass short to smash it into pieces, your upper body strength will determine how easy you find this part. Repeat the crushing until you get chunks of frit the size you want. 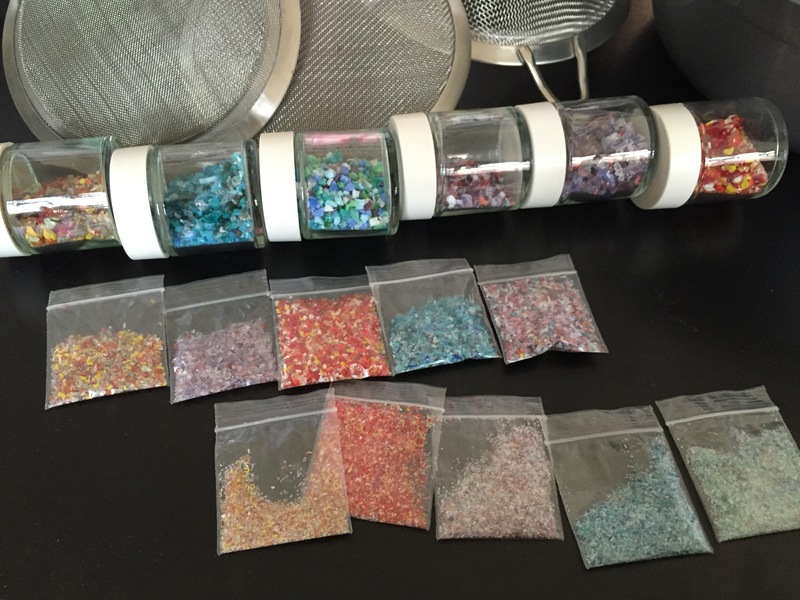 Tip your glass frit out into a baggie or container as with the other method, keep your colours separated. To switch to another colour use a bottle brush to dust out your frit crusher, it’s always a good idea to wear protective glasses and a mask in this step. If you want your frit graded by size, see step 7 in the first set of instructions on how to sift frit. Because frit crushers give you very fine dust, it is extremely important to wear a fine dust particle dust mask for this step. 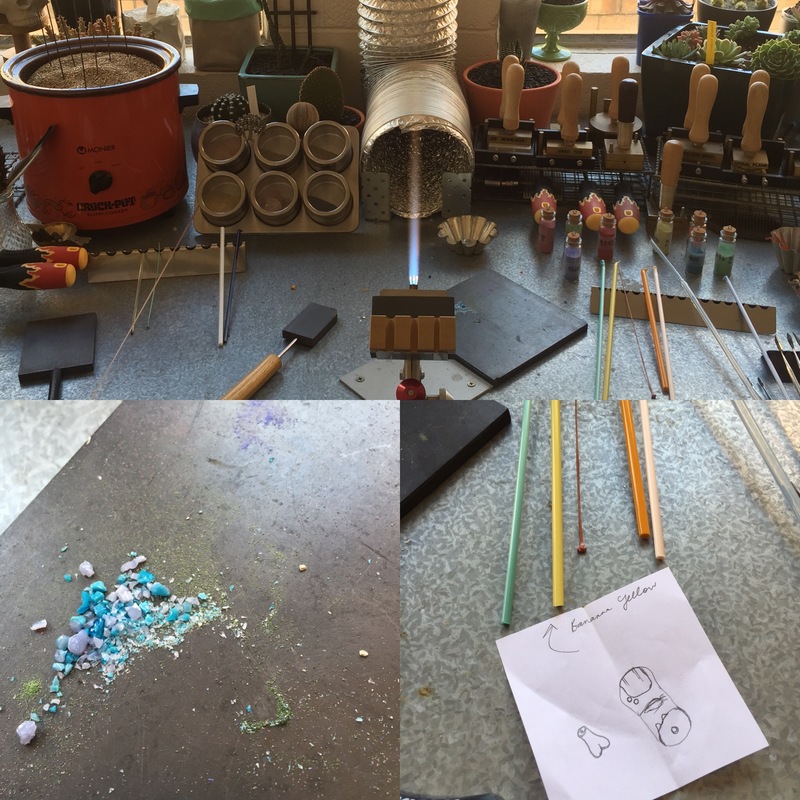 Hint: I only use my frit crusher to gently break up larger chunks of frit from the heat and fracture method as the glass dust from 104Coe glass isn’t useful in bead surface designs. Hint: I accidentally discovered that I could make “glitter” by using the dust from crushed Goldstone stringers. The trick to not burning out the goldstone dust on your bead is to roll your bead in it when its warm (not red hot) and around the world encase cool. Do not use the heat and swipe method or the hot blob method of encasing. The best thing about making frit is that when you hit on an amazing blend you can create more of it to give away as gifts or if you’re enterprising; sell it. 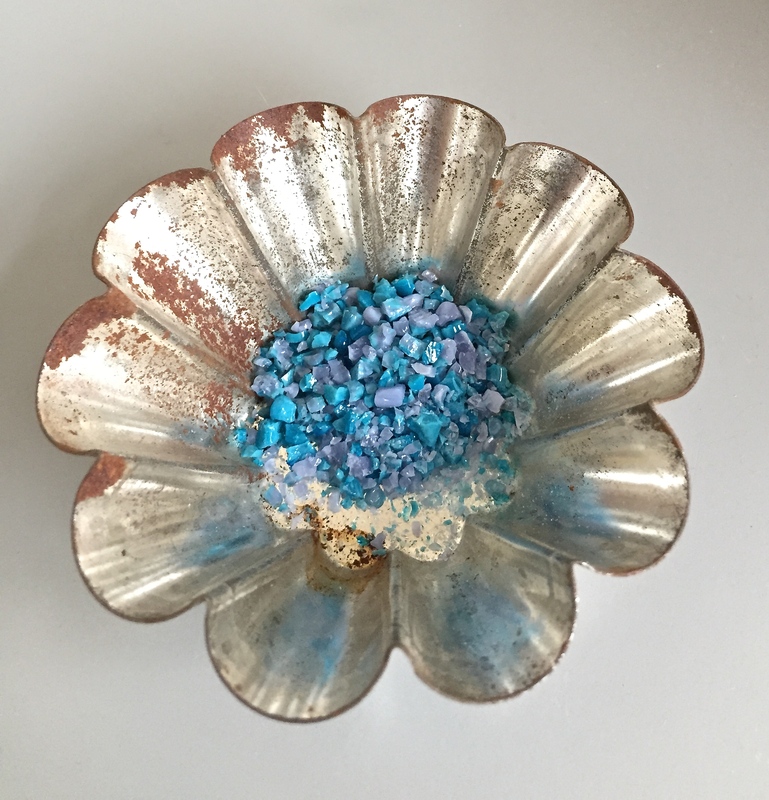 Listed below is one of my absolute favourite blends for the base of “watery” floral beads, I always start with these two base colours then add in other transparent colours. I like to use “size 0” frit, which is about the size of poppy seeds or “size 1” frit which is about the size of sesame seeds. If you use chunkier frit, such as about the size of an apple seed your results will be just as nice and because the frit is larger allow you to cover more of the bead with raised surface designs without losing the integrity of the frit blend. 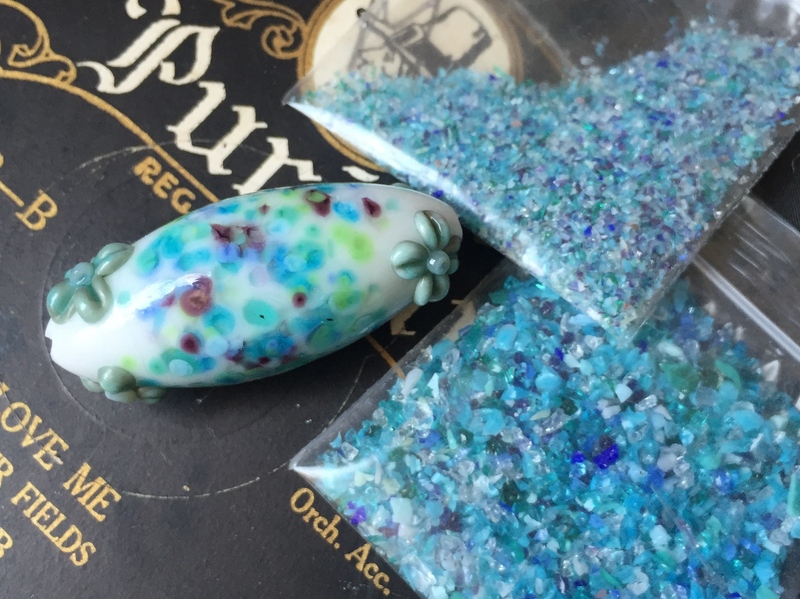 The base of my favourite hand made blend is Effetre Dark Turquoise and CiM Glacier, these two colours are usually found in all of my frit beads. Because I love the soft watercolour blue background it creates. I made this blend about 9 years ago, which is why it is Effetre heavy. You can substitute CiM colours that are similar to the Effetre colour range now. I’ll use a teaspoon as the base measurement so you have an understanding of how much of each colour to put into a mix. I cut the bottoms off aluminium “soda-pop”/”soft drink” cans, sand off the sharp edges to make them smooth and even and use as frit holders. Frit needs to be heaped into the bottom if your bead is small. If you have a jewellery saw, cut a groove into each side to accommodate a mandrel. If you’re on a budget, these are just as good as any commercially bought frit tray (and they stack when not in use). This recipe will create a nice “spring” floral colour palette. You can add more purple and pink glass to counterbalance the greeny blue tones. I like to use CiM Gelly’s Sty as my pink for frit blends, CiM Rose Quartz can devit. For added effect I trail CiM Cirrus over the top of this blend to allow for a “watercolour” reaction. If you choose to modify this blend and add yellow glass, remember that some yellow glass doesn’t like to be heated fast and it will “fry” or “sizzle” which can cause colour reaction/colour loss/bubbling. COE96 yellow frit does not have this issue with yellow and orange glass. Also yellow transparent on top of blue opaque or transparent glass can turn green. Keep that in mind when creating yellow or orange toned frit. Watercolour “Spring” Blend With POP! If you’re interested in replicating the blend in the photo above of the frit beads made on white glass here’s a list of the following colours, unless noted everything is 1 teaspoon. The base beads are made in either Effetre White or Lauscha White Kryolith. I prefer Lauscha White Krylolith because it’s so smooth to melt and has such a creamy density to it that Effetre White doesn’t have. It’s almost impossible to see the difference between the two once fired and out of the flame, but to me Effetre White is brighter. However, in relation to the frit mix there was no obvious colour reactions or difference in colour because of choice of base bead. 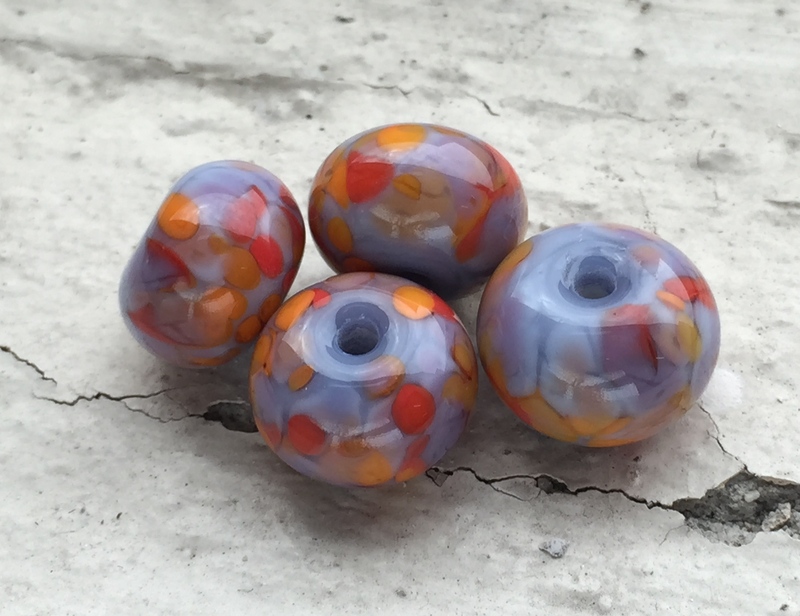 For a reaction frit blend use the following opaque colours for a mix that will create strong webbing and curdling effects on the surface of your bead, even if only gently melted in together. This reaction blend can also produce cool reduction effects, such as reflective patches. The “yuck” beads. What was I thinking??? Effetre Ivory is not always the best base for reactive frits. All these beads have the addition of Effetre Coral Special to the base reaction frit (this colour is very similar to CiM Schoolhouse Ltd). The frit is pictured above in the tray, I’ve used CiM Cirrus in the blend, and I don’t recommend that you do. Instead use Effetre Pale Blue Trans or Trans Pink. The tab bead is frit on Effetre Pastel White. The others are Effetre Dark Ivory. The encased bead is the reaction frit with no green glass added. To darken Frit Blend Two or to get more reactive effects, use 1/4 Teaspoon Effetre Petrol Green instead of Pea Green. For added “organic” effect I trail hair fine Effetre Intense Black over the surface of the bead and gravity swirl. I like Frit Blend One on top of pale pastel colours, such as CiM Ginger or Effetre Trans Dark Lavender, because the frit is heavily blue-green it is nice to have the purple background for contrast. If you use CiM Chai instead of Pea Green in Frit Blend 2, the effect is really lovely and reminds me of the colours in cottage gardens because of the reactions. I’ve also added CiM Canyon De Chelly frit to Frit Blend 2, this is good for a “woodsy” effect. My other trick is to not include any green glass in either frit blend and instead introduce Effetre Coral Special frit, I think it’s a wild colour combination against the purple. Technically peach and purple clash on the colour wheel, which makes it an interesting choice. If you add green glass to this mix with Effetre Coral Special, make sure it is a stable transparent as Effetre Coral Special likes to react and go muddy against green. This muddiness is demonstrated on the tab bead in the photo above of the “yuck” beads. I reduced it to remove some of the muddiness by reducing the bead to give more of a reflective surface (basically trying to hide how ugly it is. Well… that didn’t work, it’s still an ugly bead, but now it’s ugly all dressed up, ergh!). The top most bead shows how Ivory reacts with the Coral blend frit, I got that nice curdly edge that Ivory gets around purple glass – but its still an ugly bead. 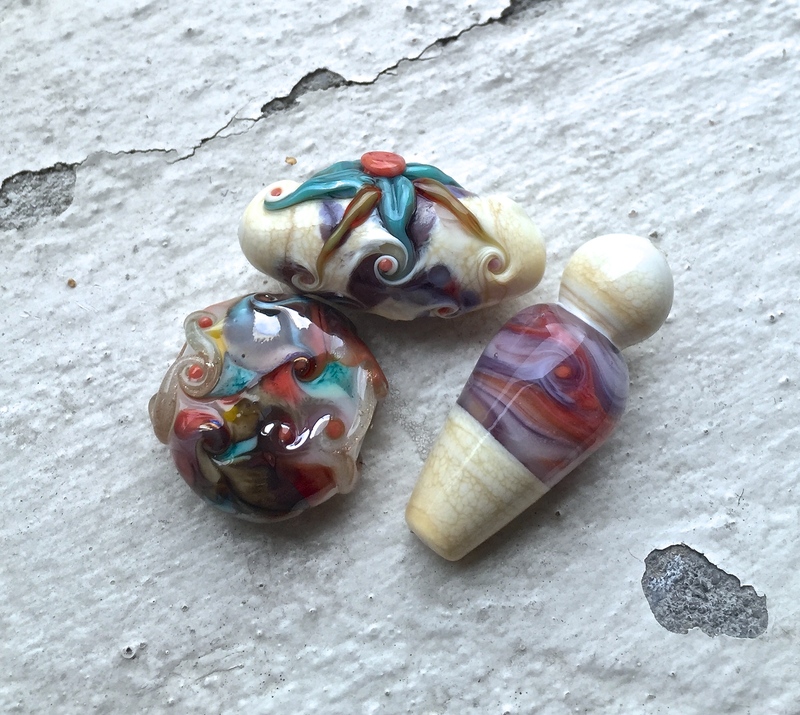 The last bead shows the frit blend with coral encased over Effetre Ivory and I have no idea what I was thinking with the shape of that bead. 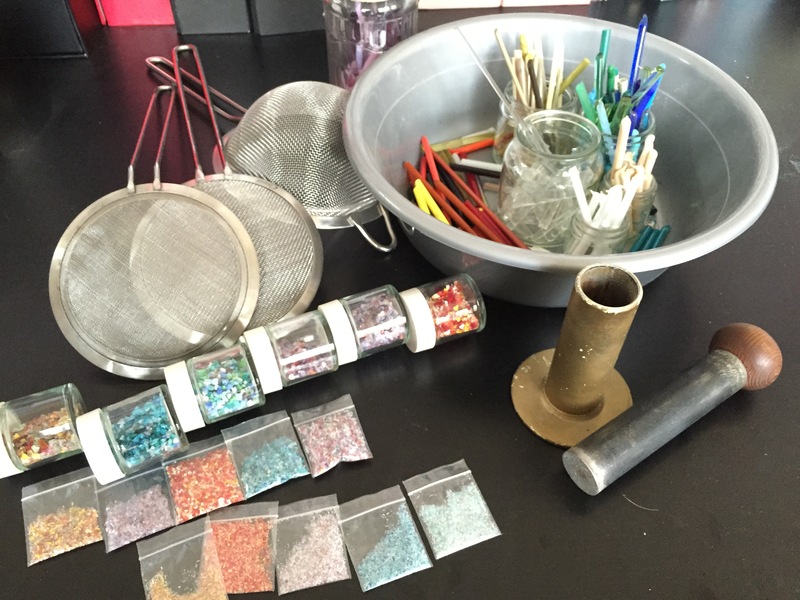 Have fun with making your own frit!